These colorful fall foliage pictures were taken in downtown Fairport, NY, twice voted Top 100 Best Places to Live in America (2005 and 2008). 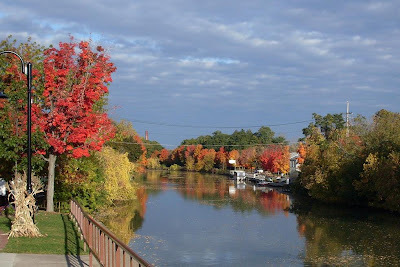 This quaint village, incorporated in 1867, straddles the Erie Canal and a major cross-country railroad line. The canal path seen in the pictures runs from Buffalo to Albany, with some interruptions. You're looking to the west, toward Rochester (about 20 minutes away), along the Erie Canal on a brilliant October morning. Along the north edge of the canal is a fine little wooden dock, handy for tying up close enough to walk to the hotdog stand (just behind the orange tree in the middle). There's the boat rental, open by appointment now that summer's over. In-season, most of the watercraft would be out on the canal, piloted by tourists and locals alike, chasing the ducks and racing the joggers and bicyclists on the path alongside. This shot looks like an oil painting waiting to happen, doesn't it? Or a not-too-difficult jigsaw puzzle. Not one digital effect was used in the posting of this picture, I swear! Who says you have to go to Lake George or Vermont to see beautiful fall colors? Dazzling deciduous displays await you right here in Fairport. Accommodations include everything from luxury Bed & Breakfasts to roadside motels. Closest camping is the Canandaigua KOA (about 17 miles). Fairport also offers dining out choices ranging from McDonald's to diners to country club restaurants. Exit 45, Victor, from the NYS Thruway lies about 15 minutes to the southeast. Call ahead, and we'll have dinner waiting for you when you get here. Click here to see the rest of these pictures on Google Picasaweb. Do you recall how early in October these photos were taken? These were taken on October 14, 2008, Seth. 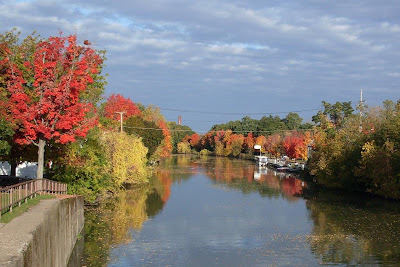 Probably the most spectacular fall color display I've seen in Fairport since we moved here in 2006. Thanks for stopping by! Writing tips: Should I use "your" or "you're"?